Showers, bathtubs, etc., are no longer plumbing fixtures. They are pieces of beautifully designed and carefully crafted furniture that aren’t just meant to be utilitarian, they are meant to complement your personality and facilitate your lifestyle. 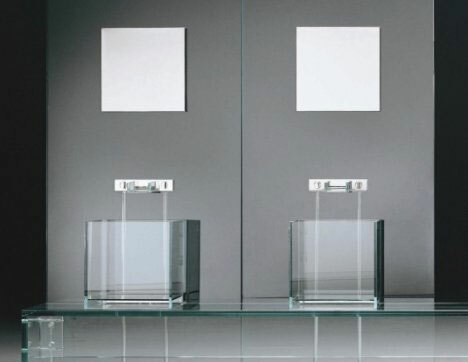 The following collection is sometimes intricate, sometimes minimalist, but always beautiful and practical. Another design by Alessandro Lenarda, Milo is much more unconventional. With options of leather or wood headrests and drawers, this Japan-inspired tub experiments with combination of disparate elements while maintaining beautiful geometric symmetry and stylish craftsmanship. Why compromise when you can have the best of both worlds and be economical at the same time? 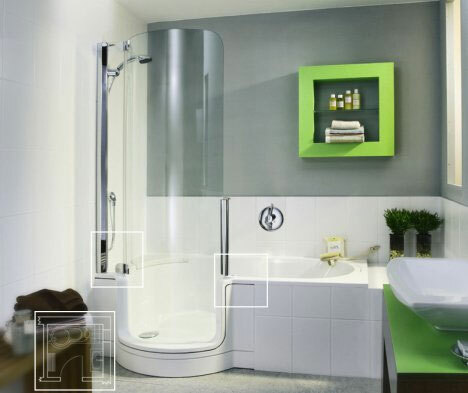 With the all-in-one Twinline design from Artweger you no longer need to decide between a shower and a tub, or be forced into one option because your small bathroom can’t accomodate both. Small but beautiful and functional, Twinline allows you to enjoy a bath when you’re in the mood while giving you the option of a quick shower when you’re in a rush. 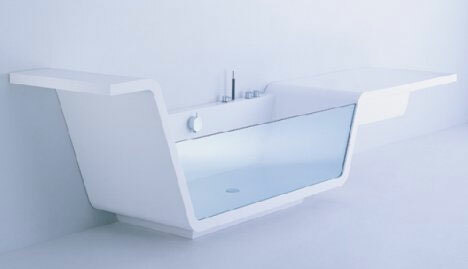 The Alpha from Morphosis is a two-person whirlpool tub with an unforgettable design. 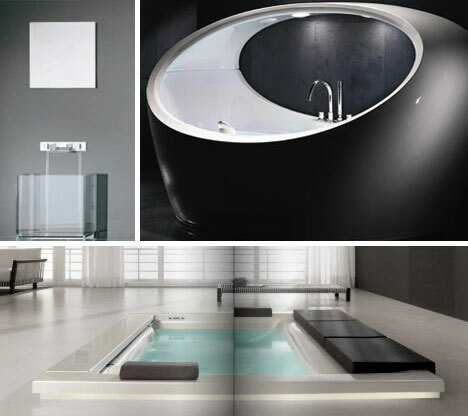 Inspired by nature, the design aims to ‘envelop, charm, and amaze’, but is not all beauty, it also comes with hydrotherapy and hydromassage built-in. 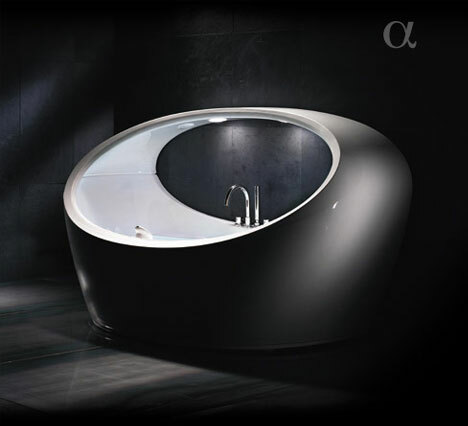 The arch of the tub embraces you in a protective gesture simpilar to that of a seashell. 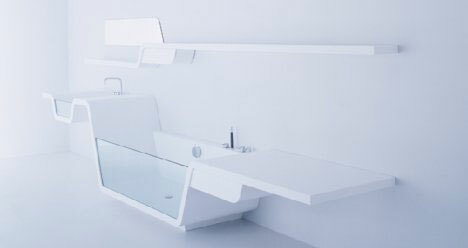 The Ebb bathroom concept is innovative, beautiful and practical. 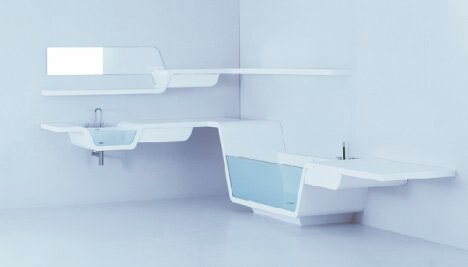 The incredibly modern design is formed by fusing together concepts of bath, sink, and shelving units into a natural symmetry and connectivity. 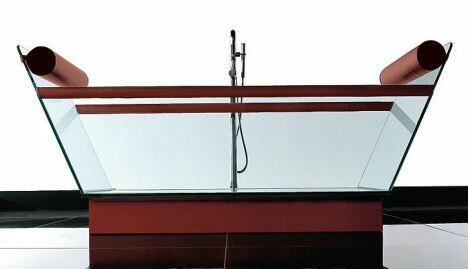 The bathtub and sink are made from natural acrylic stone and both have semi-transparent glass side panels. 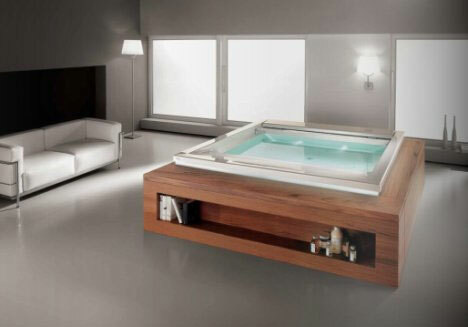 The latest Seaside bathtub from Tueco is truly fantastic. Backed by studies and certifications, the bathtub is whisper quiet, ensuring the only sound you hear is the soothing sound of water flowing gently, allowing you to relax without any distractions. With patented hydrosonic ultrasound technology, Tueco’s bathtub doesn’t just bring superficial comfort, it massages 2/3 cm deep into the skin, 3 million times per second, and evenly distributes the effects throughout your body. 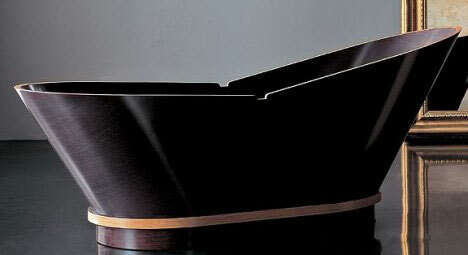 Designed by Alessandro Lenarda, Calypso Wenge is an experiment with wood design. With no superstructure to support it, the wooden shape itself becomes the shelf. 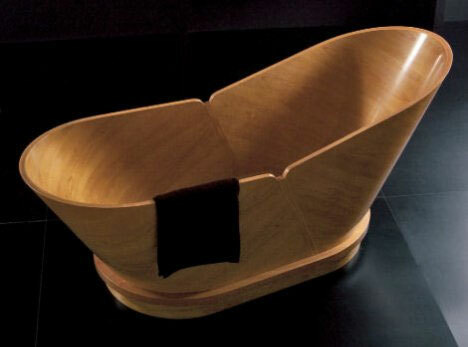 At 183x70x61/79, Calypso is a deep tub with a comfortable backrest which will truly help you relax. If you’re looking for a minimalist design, it doesn’t get better than this. 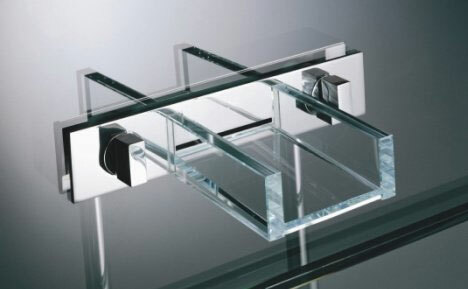 While keeping it incredibly simple, the designers haven’t compromised on elegance and beauty. 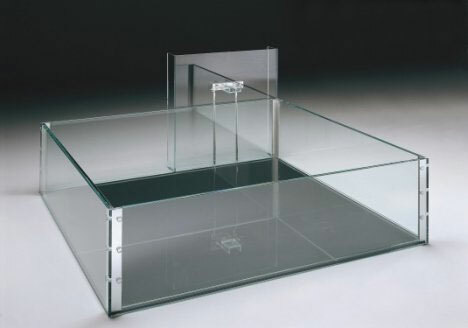 Predominantly using transparent glass (with touches of stainless steel) the finished product is both visually luxurious and deceptively simple at the same time. 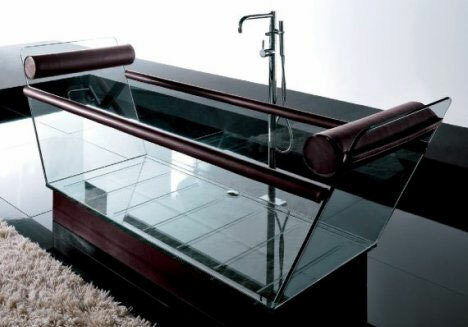 The collection includes wash basins, faucets and a tub.